Shoes can either help with foot problems or have the potential to cause foot problems. There are several ways to help get your feet into a properly fitting pair of shoes. While shopping for shoes online is very popular, you may be relying only on the stated size and not on how the shoes will actually fit on your feet. Use these guidelines and tips to know how to choose the right shoes and ensure they fit you correctly. Stand when measuring. Be sure to stand up when measuring your feet. When standing, your feet will spread out more. It is better to have someone else take the measurement because you need to stand tall and look straight ahead with your weight centered over your foot. How you stand can affect the size and shape of your feet. Measure the arch length. An important part of the shoe fit is the arch length. The arch length is measured from your heel to the ball of your foot (where your big toe joint bends). The bend in your big toe should match with where the shoe bends. With both shoes on, rise up onto your toes. If you feel the shoe bend before or after the big toe joint, then the shoe is not a good fit for your arch length. Size does not matter. Try not to get too concerned with the shoe size number. There is a big difference in shoe sizes between shoe companies because of the lasts used. A last is a form that a shoe is molded around. Each company uses different lasts, meaning that a size 8 New Balance will not fit the same as a size 8 Nike or a size 9 Manolo Blahnik will not fit the same as a size 9 Jimmy Choo. Fit shoes to the larger foot. No two feet are the same. One foot is usually slightly larger than the other foot. Buy the shoe size that fits the larger foot. There are different pads and inserts that can take up room in the shoe if it is too big, but you cannot add space to a shoe that is too small. Fitting shoes to the larger foot have a limit. If your feet are more than 1 1/2 sizes different, then get two different sized shoes. You may try on shoes at the shoe store or fresh out of the box when you order them online. Here are tips to help you know whether to consider them further or to reject them. Wear appropriate socks or hosiery. It is important to wear the socks, nylons, etc. that you would normally wear with the type of shoes you are trying on. For dress shoes, you want to wear the hosiery you would with them (or none if that is how you'll be wearing them). 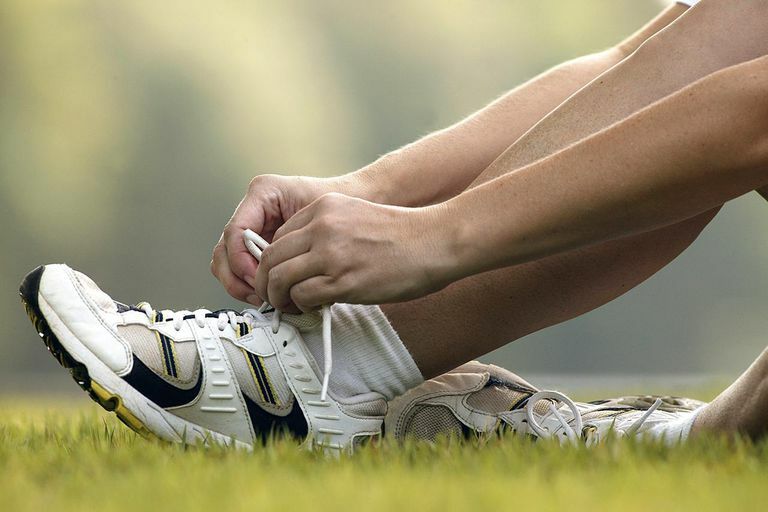 For athletic shoes or outdoor shoes, be sure to wear the thickness of socks you will usually wear with them. The thickness of the sock will affect the fit of the shoe a great deal. Leave 1/2 inch at the front of the shoe. There should be about a 1/2 inch between the end of your longest toe and the end of the front of the shoe. Generally, this is about the size of the tip of your index finger (small hands) or pinky finger (large hands). While for many people the big toe is the longest, other people have a longer second toe, known as Morton's toe. Leave 1/8 inch at the back of the shoe. You do not want the back of the shoe too tight against the back of your heel. This may cause skin irritation and blisters. It is acceptable to have about a 1/8 inch between the back of your heel and the shoe. Select shoes with room in the toe box. The toes need room to move. Not having enough room for your toes may lead to corns, calluses, neuromas, or deformed toes. Walk with both shoes on. Do not be afraid to take your time and try on both of shoes and walk around the store. Walk on different surfaces (carpet, tile, etc. ), if available. Ideally, it would be best to take the shoes to a gym and walk on a treadmill. This will keep the shoes clean and give you a chance to really try the shoes out. Some stores offer this service, so do not be afraid to ask. If you have ordered online, be sure that you follow their guidelines as to what form of wear is acceptable in order to be able to return the shoes. Shoes should be immediately comfortable. Shoes should be comfortable in the store or right out of the box if you bought them online. Do not buy shoes with the hopes that someday they will be comfortable enough to wear. Return online purchases immediately if they don't feel great. Laced shoes are easier to fit. Shoes with laces are easier to adjust to your specific needs and are easier to keep on the feet. Shoes without laces cannot adjust for swelling variances and they are harder to keep on the feet, making your feet work harder. If you have foot problems or are unsure about proper shoe fit, it is highly recommended that you go to a shoe store that offers professional, personalized shoe fitting. A thorough shoe fitting and selection may take 45 to 60 minutes. To prevent foot problems, the height of the heel should be no more than 1 1/2 inches. Any higher than this puts significantly more pressure on the forefoot and may lead to foot pain down the road. 10 Points of Proper Shoe Fit. American Orthopaedic Foot & Ankle Society. http://www.aofas.org/footcaremd/how-to/footwear/Pages/10-Points-of-Proper-Shoefit.aspx.